Description: This poster is an offset litho in black,blue and orange, produced by the ECC, Cape Town. 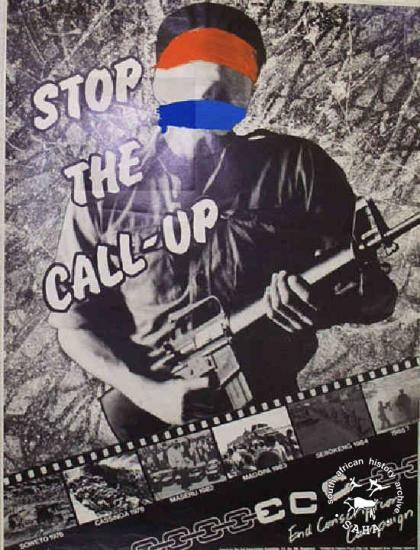 This poster depicts a sinister figure masked with the colours of the South African flag. This image symbolises what the ECC fought against. 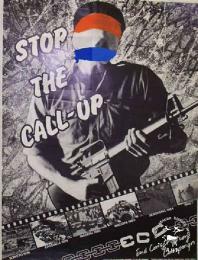 The text reads: "STOP THE CALL-UP". This poster was digitised by Specialised Archival Solutions in 2009. Reproduced in "Images of Defiance: South African Resistance posters in the 1980s" on page 129 (number 228) of the 1991 SAHA / Ravan Press edition and the 2004 SAHA / STE Publishers edition. It also appears on page 138 of “Red on Black: The Story of the South African Poster Movement”, SAHA / STE Publishers, 2007, as well as the SAHA virtual exhibition - 'The Future is Ours: Commemorating Youth in the Struggle'.